Becahi’s Ryan Anderson, top, and Seth Koleno, Bald Eagle Area High School, Wingate, wrestle during the 138-pound bout. Anderson won by technical fall, 20-4. Click on any of the smaller pictures to browse the rest of the photos. 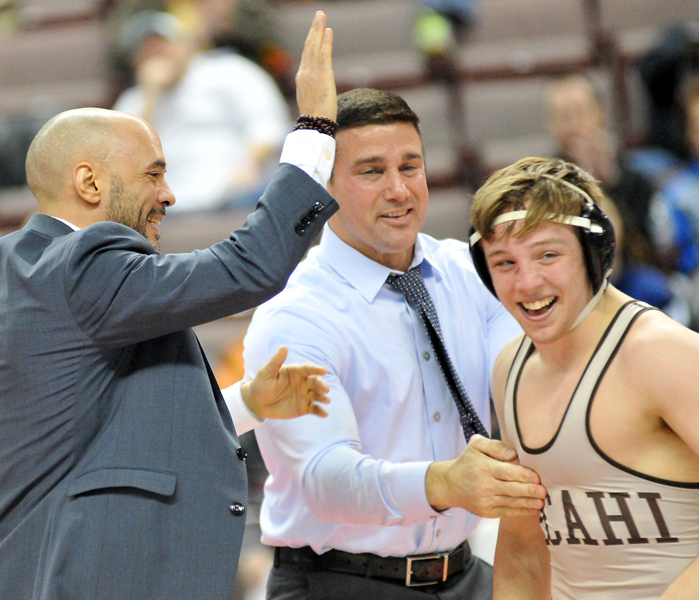 Ryan Anderson, right, celebrates with Becahi’s assistant coach Randy Cruz, left, and head coach Jeff Karam, becoming the school’s newest PIAA Class AAA state wrestling champion. Anderson captured the title by gaining a technical fall 20-4. Locked in a head-to-head wrestling battle during the 126-pound bout are Becahi’s Kenny Herrmann, left, and Dalton Rohrbaugh, Spring Grove Area High School. 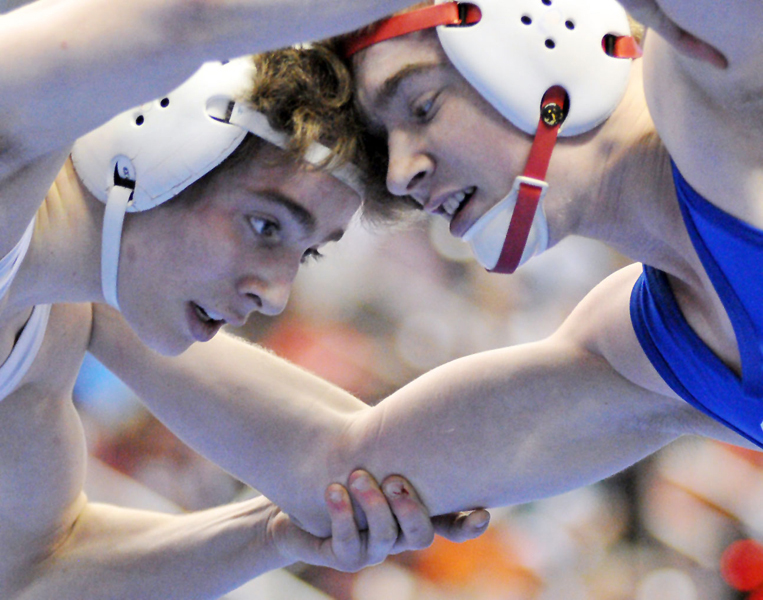 Rohrbaugh took third place in the Class AAA state wrestling tournament by a slim 7 to 5 margin. 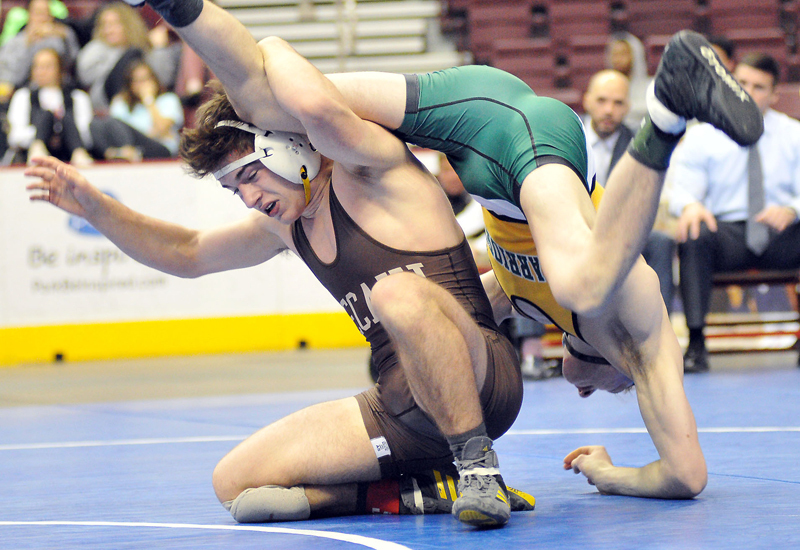 Becahi’s Cole Handlovic, left, lifts Job Chishko, Penn Trafford High School, Harrison City, during the 145-pound bout for fifth place during the PIAA Class AAA wrestling tournament. Chishko defeated Handlovic 8-3. Becahi’s wrestling team managers working matside are Jill Vanic, left, and Megan Papcsy. Richie Markulics, right, Notre Dame High School (NDHS), Easton, looks for a takedown on his way to a 3-2 victory for third place in the 120-pound bout. 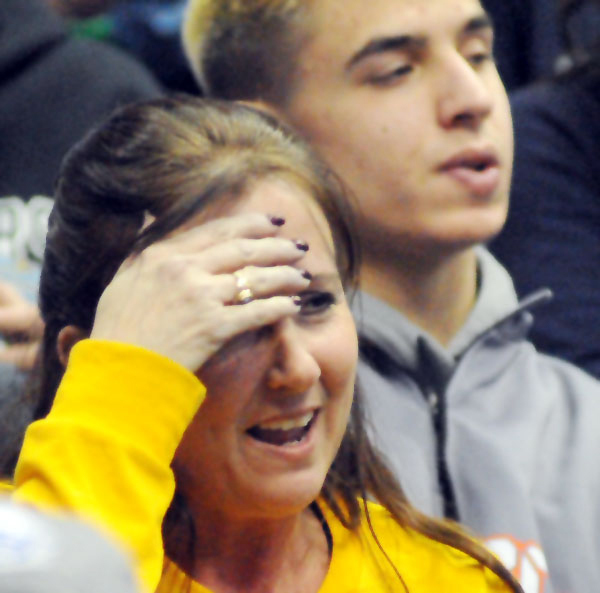 Melanie Markulics watches her son, Richie Markulics, NDHS, wrestle for and win third place 3-2 during the 120-pound bout. 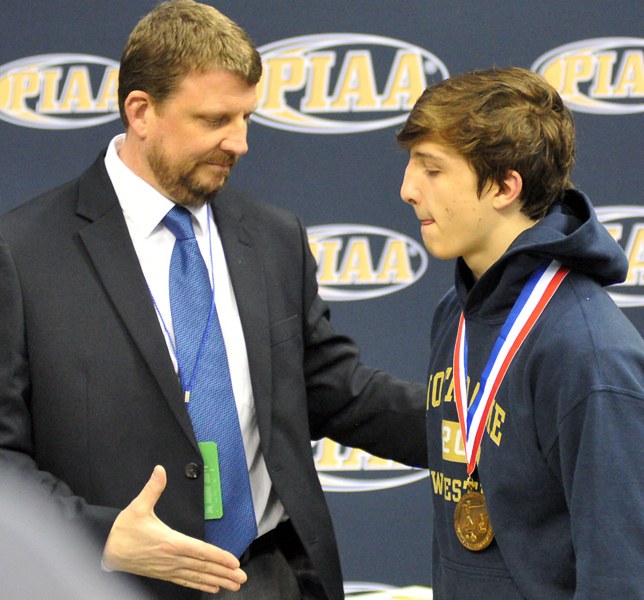 NDHS head wrestling coach John McGuire, left, congratulates his son, Ryan, before the 132-pound weight class medal ceremony at the PIAA Class AA mat tournament. McGuire finished fifth in the state. 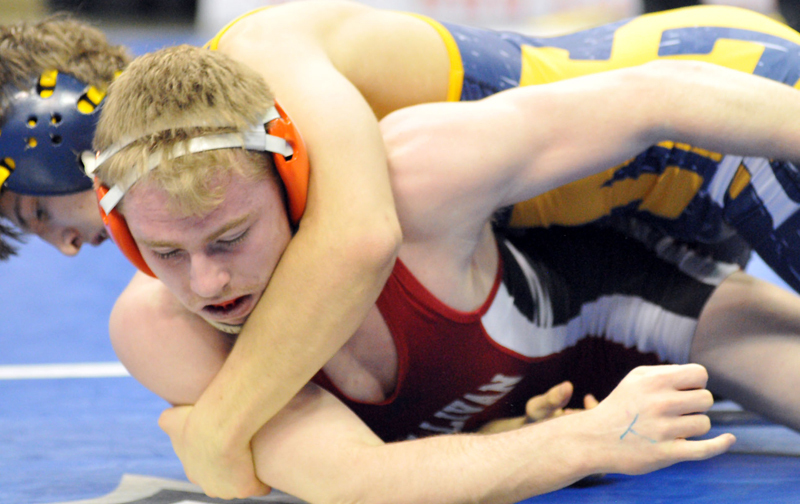 Ryan McGuire, top, controls his opponent Nathan Higley, Sullivan County High School, Laporte, for a 4-0 shutout and fifth place in the 132-pound Class AA tournament.